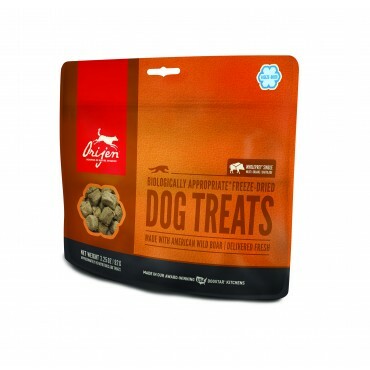 Gently freeze-dried, these delicious and nutritious biologically appropriate™ single-source treats are bursting with a savoury taste and aroma your dog will love. Single-source ingredient – 100% naturally raised wild boar is delivered FRESH to their kitchens, then flash-frozen and gently freeze-dried. Orijen's fresh wild boar arrives in richly nourishing WholePrey™ ratios of meat, organs and cartilage that mirror nature, providing a natural source of virtually every nutrient your dog needs.